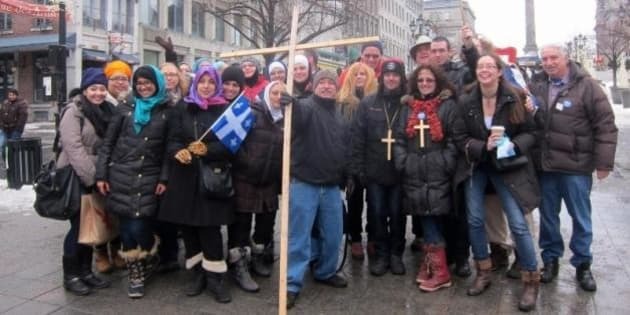 “Today basically is just to show up to work, to their everyday life and adopt one of the four symbols the [Parti Québécois] is planning to ban, so either the hijab, the turban, the kippah or a large cross,” said Sama Al-Obaidy, the creator of the Support Another Facebook page. She started the Facebook page after an incident in the Montreal Metro about five weeks ago. “A lady came up and tried to remove my hijab forcefully,” Al-Obaidy said. “She told me my hijab and myself don’t belong in Quebec and after a few exchanges of words she decided to start pulling on my veil. As it started getting loose I had to eventually stop her,” she said. The attack is one in a long string of altercations that have occurred since the PQ announced its proposed secular, or values, charter. The charter would ban overt religious symbols in the public sector workplace. Al-Obaidy decided to organize a day of action for today, just before the start of the Bill 60 hearings. On Sunday, Al-Obaidy, along with her sister Yusr, Hampstead Mayor Bill Steinberg and others, handed out kippas and other religious symbols for people to wear on Monday. The Facebook page links to videos on how to wrap a turban and hijab. Stay tuned to the CBC Montreal website for coverage of the Bill 60 hearings.